Today marks the 10th anniversary of the first of the two massive tax cuts signed by President George W. Bush and is yet another great opportunity to illustrate that both tax packages failed to deliver on their promised results. Bush told the country that the tax cuts would result in economic growth and sustained prosperity, but the economy got neither. In fact, from 2001 to 2007, the economy experienced the weakest job growth since the end of World War II. While the nation's millionaires and billionaires were enriched, average household income fell for the first time on record. Worse, since the Bush tax cuts did not pay for themselves — as many conservatives claimed they would — the two tax packages added trillions to the nation's deficit. 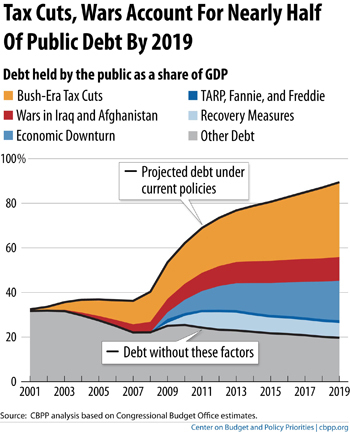 During the current debate on deficits and debt, it's important to remember just how much the Bush tax cuts accelerated the fiscal troubles we're now facing. During Bush Years, Household Income Declined For First Time On Record. According to a report by the Center for American Progress: "The Bush economic cycle saw the first decline in median household incomes of any cycle since 1967, when the Census Bureau began tracking household data." 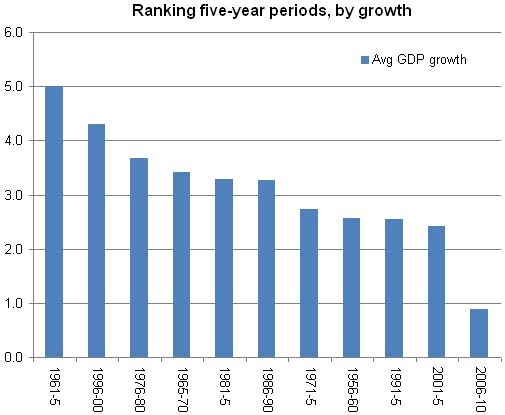 The competition for slowest growth is not even close, either. Growth from 2001 to 2007 averaged 2.39 percent a year (and growth from 2001 through the third quarter of 2010 averaged 1.66 percent). The decade with the second-worst showing for growth was 1971 to 1980 - the dreaded 1970s - but it still had 3.21 percent average growth. Bush Cuts Followed By Slowest Jobs Growth Since The End Of World War II. According to a report by the Center for American Progress, "from March 2001 to December 2007 the economy added 1.8 million jobs for workers aged 25 to 54, only 22,000 per month. That translates to an average annualized growth rate of only 0.3 percent per month-the slowest of any cycle on record since the end of World War II and one-fifth the growth rate during the 1990s." Extending Bush Tax Cuts "Would Increase The Debt By An Amount Roughly Equal To The Size Of The Economy." As the Center for Budget and Policy Priorities points out, tax cuts do not pay for themselves. In fact, if an unpaid-for extension is enacted, by 2050, the national debt "would increase the debt by an amount roughly equal to the size of the economy."